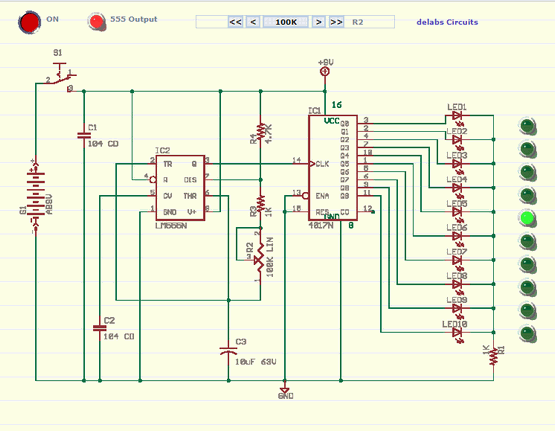 The 555 clocks 4017 counter and it counts and Ten LEDs indicate the counts. This can be used as a Sequential timer or for generating staircase waveform. You can vary the value of R2 using the controls below to make LEDs run fast or slow. The frequency of oscillation of astable 555 is given as f = 1.44 / ((R4 + 2 * (R2 + R3)) * C3). 555 Oscillator and Decade Counter xml use iframe part for your Webpage or Blog.